This medium spice blend contains lemon juice, tamarind, ginger, coriander, garlic, and spices. Due to the authentic nature of this product, some oil separation may occur. We recommend that you stir it well before usage. 1.15 kg per pack. 20 g per serving/portion. Ideal for the skilled Chef who likes to create their own dishes, but doesn't have the time to cook from scratch i.e. no time to blend oils and spices to create a base for their recipes. 6 months shelf life once opened - use when required without wastage. Store in a cool dry place away from sunlight. Once opened, use within 6 months and store at room temperature. 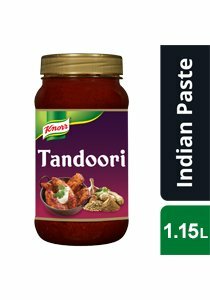 Do not refrigerate and no not store diluted paste.